If there’s one thing the Canary Islands are famous for, it’s the strong trade winds. Well, that and the hot sunny weather and crystal clear waters. It’s pretty understandable then, that Fuerteventura (the second largest of the Canaries) is a haven for extreme water sport enthusiasts. For the past 26 years, the crème de la crème of the wind surfing and kite-boarding world have descended upon Fuerteventura for the world championships at the end of July. Flights to Fuerteventura are understandably popular at this time of year, not just with sports enthusiasts but also with tourists. 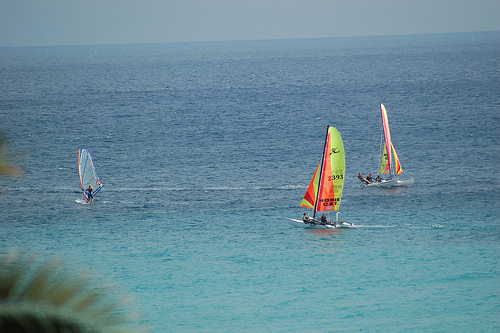 If you have a strong interest in wind surfing or kite boarding the competition is not to be missed. Watch and be inspired by athletes at the top of their game whilst relaxing on the white sand sipping a cool beer. The high winds and island location means that the island is ideal for kite surfers: if the wind is blowing out to sea on one side of the island, it will be fine on the other. Fuerteventura played host to the World Championships for Kite Surfing in 2008, too. If you’ve never tried it before there are plenty of kite surfing schools across Fuerteventura, but amateurs should definitely beware of the strong winds (I speak from experience here: being dragged along the beach by a kite is nowhere near as much fun as being dragged along the waves). Fuerteventura is known throughout Europe as a surfer’s paradise, and there’s unlikely to be anywhere better to learn than at one of the many surf schools that ply their wares along the North of the island (particularly around the town of Corralejo). For seasoned surfers Fuerteventura has lots to offer as long as you avoid the touristic beaches. Heading up to Fuerteventura’s famous North shore, you may have the good luck to encounter “the bubble”: a famous wave common on days with a good North or North East swell and offshore winds, causing hollow waves with a perfect height. Los Lobos is utterly beautiful, and following a short ferry ride from Corralejo you could find yourself surfing 500m around a volcano. Watch out for sharks and the jagged reef below: if you do this properly it could be the greatest surf of your life. Although the beaches are where the serious extreme sports begin, there’s some great landscape on the island for avid mountain bikers. Dusty tracks take you through deserts, lost villages, and volcanoes. It’s best to drive to the interior of the island to really make the most of what’s on offer. 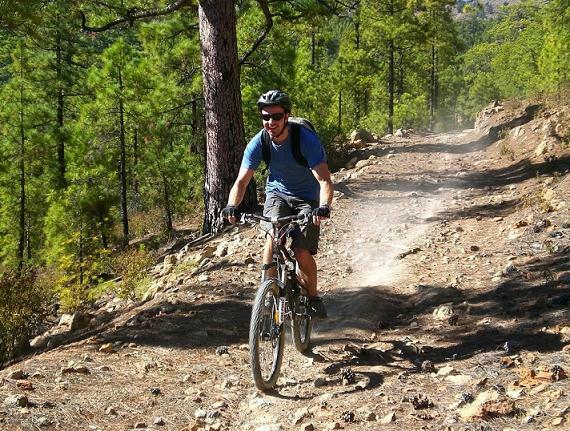 There are mountain bike tours, but if you’re a proficient cyclist you may enjoy the peace and quiet that being alone and cutting loose in the barren landscape brings. Extreme sports, extreme landscape, and extremely gorgeous weather: it’s clear that an adventure holiday to Fuerteventura won’t disappoint. James writes for Skyscanner.net, a flights comparison who compare flights to Fuerteventura and throughout Spain as well as hundreds of other airports worldwide. This entry was posted in Europe, Featured, Mountain Biking, Surfing, Travel, Wind Surfing and tagged Fuerteventura, kite surfing, Mountain Biking, Surfing. Bookmark the permalink.